LGBTQIA Endowed Scholarship is OPEN FOR APPLICATIONS! Proof of enrollment and GPA. *An unofficial transcript will suffice. A copy of their most current resume. BOSS System: Apply for the LGBTQIA Endowed Scholarship! Since our founding in 2010, the Bobcat Pride Scholarship Fund (BPSF) has helped over 55 students with more than $70,000 in academic achievement scholarships, leadership development opportunities, student internships and emergency funding. With the love and support from our generous community members, family and friends, our award amounts have grown from a $500 stipend to a $3,000 scholarship! Drag Out Funny started as a small gathering in The Root Cellar and, in seven years, has grown to our biggest, most celebrated fundraising event of the year, raising over $10,000 consecutively for the last three years. We could not be more proud and humbled by the love and support our Central Texas community has shown us. Along with our organizational growth, comes the increase in our need for additional resources. We are looking to our on campus partners at Texas State University in ALLIANCE to assist with these efforts to build a sustainable structure. Moving forward, BPSF will be absorbed by ALLIANCE to provide needed support, structure, and resources to our students and community partners. This decision to collaborate will enable the LGBTQIA Endowed Scholarship to reach the full endowment level, guaranteeing scholarship opportunities for Bobcat students indefinitely! Our Director of Student Programming, Madi Tabersmith, will continue to stay involved on campus as she assumes the role of ALLIANCE President. Our Executive Director, Jeanne Heinen, serves as an Assistant Director of Development at Texas State and will help steward future fundraising efforts as well as the cultivation of community partnerships. Many of you may be wondering about Drag Out Funny - we don’t blame you! We are looking at all options, and welcome any ideas for collaboration to continue this fun and exciting tradition! While BPSF may change, the need for your support will not. 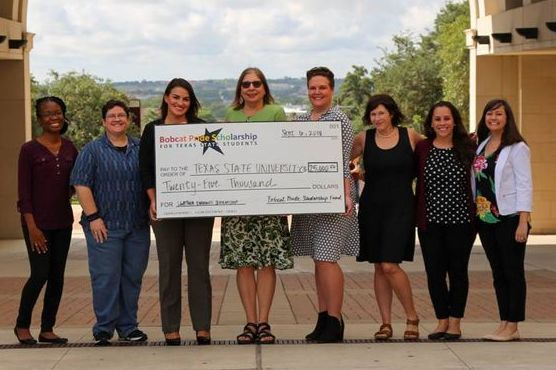 The Texas State University LGBTQIA Endowed Scholarship will continue to grow and help students for years to come. This scholarship is greatly reliant upon your continued commitment to our mission to support LGBTQIA Bobcat students. We have enjoyed working with the community to provide support to LGBTQIA Bobcats and are thrilled to help guarantee scholarship opportunities for Bobcat students indefinitely because of this collaboration. We warmly thank you for your support! Bobcat Pride Scholarship Fund® ©2014 | Bobcat Pride Scholarship Fund, a recognized 501(c)(3) nonprofit organization, is private and independent from Texas State University and any of its organizations.